Games play an important role in the life of every human being. Games relax us. They keep our body in top form. Games tone up our muscles, improve the circulation, and develop the physical skills that we need in other areas of life. Golf is a game that is played all over the world. It is played with striking the ball with the clubs and need to push them inside a set of holes. This diversion needs a lot of effort and good technical skills. This is a short exercise that will help you to analyse the fundamentals of the game. 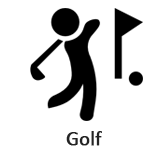 This instructive exercise is provided for those who are interested to play golf. The tutorial explains all the basics of the game for those people who are very much interested to understand the game of golf. Before going through this tutorial, you need to have a desire for playing golf and willingness to earn knowledge about the game.